The study of Mechanical Engineering at Auburn began as the result of the Morrill Land Grant Act, which had profound effects on education throughout the South and in our country. It promoted a technical, practical education for the "industrial classes in the several pursuits and professions of life." Proposed by farm and industrial groups from the Midwest prior to the secession of the South, the Act was opposed by Southern congressmen and passed only in 1862 when the Confederate States had left the Union. Later the South would need just the kind of education the Morrill Act supported in order to develop its natural resources and repair its tattered economy after the Civil War. In 1882, Auburn (then known as the "Agricultural and Mechanical College") had a dynamic, visionary new President, William L. Broun from Vanderbilt. Well aware of the impending technological revolution and of the South's critical need for trained manpower, Broun advocated curriculum changes to achieve a balance between scientific studies the classic liberal education. Broun introduced his "general" course consisting of Agriculture, Chemistry, Mechanics, and Engineering. His tenacity shaped Auburn University's future in ways he may not have imagined. In the critical days during Reconstruction, were it not for Auburn's early vocational identity, the college would logically have been incorporated into the University of Alabama system. In 1885, President Broun inaugurated a "Department of Mechanic Arts" located on the ground floor of what was to be renamed Langdon Hall. Also in 1885, the college's first Instructor in "Practical Mechanics," George Bryant, a graduate of Massachusetts Institute of Technology, was added to the faculty of eight and a Mechanical Art Laboratory measuring 90 by 50 feet was constructed. Basically a woodworking shop, the laboratory was outfitted with a steam engine, machines, and tools, useful for instruction. There were three degree courses, each leading to the Bachelor of Science and requiring four years for completion: the first in Mechanics and Engineering, the second in Agriculture and Chemistry, and the third in Latin Science. By the mid 1880's, state money became available for education. Helping to finance the emergence of the new Mechanic Arts Department, the Alabama legislature decided to give the college one-third of the net revenue collected from a tax on fertilizer, along with its first outright grant. In 1885, the school's name changed to "Alabama Polytechnic Institute", largely due to an increasing focus on engineering studies. The following year a forge and foundry building was erected adjacent to Langdon and a five-horsepower Weston dynamo was installed in Langdon's cellar to light the building, providing the first electric lights in town, and the first in any college building in the South. In 1888, two new Mechanic Arts Assistant Instructors, B.A. Blakely from Cornell University and John Jenkins Wilmore from Purdue, arrived on campus. Wilmore, who had grown up on a farm in Indiana, began his illustrious 55-year career with initial misgivings after a train ride in the middle of a wet night deposited him in the tiny college town. He said later he was tempted to get back on the train, but without the money to return home and a yellow fever epidemic further down the line in Montgomery, he had little choice but to stay. In 1891, he was named Director of the Department of Mechanic Arts and eventually became Auburn's first Dean of Engineering, a position he held from 1908 until his death in 1943. Electrical and Mechanical Engineering were separated into two distinct departments in 1905, bringing to four the number of engineering studies offered, with mining and civil engineering. In 1918, consonant with America's involvement in the war effort, Auburn's ME Professor Fullan pledged to train "an army of mechanics": and the University proceeded to train several contingents of student soldiers in general mechanics, drilling metals, pipe fitting, sheet metal work and the like. 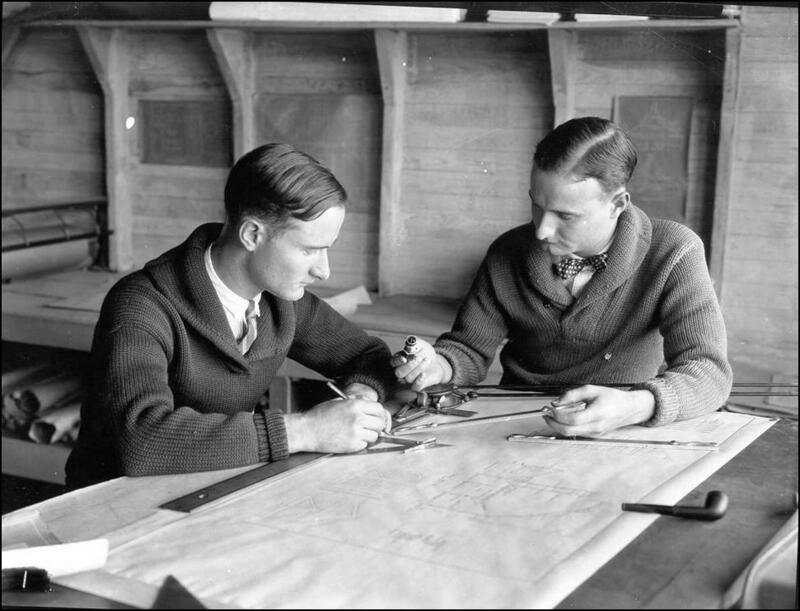 The late ‘20s brought a new surge of development in engineering facilities provided by private gift funds. Ramsay, Ross, and the "L" Building were constructed. In 1932, a triumvirate was chosen to run the school in the trying circumstances of the Great Depression. John Wilmore of Engineering, Bolling Crenshaw of Mathematics and Luther Duncan of Agriculture assured the school's survival despite the failure of the State to pay appropriations. After three years, Professor Duncan became President and before his death, the bonded indebtedness of API was paid in full and 14 new buildings, including Wilmore Labs, were constructed by the late 1940s. During World War II, Auburn trained 38,500 military recruits through the Army Specialized Training, Engineering Science, Management and War Training Programs.